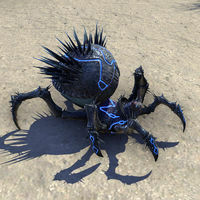 Small spider-like creatures found on Summerset and Artaeum. They are usually found accompanying stronger Yaghra. 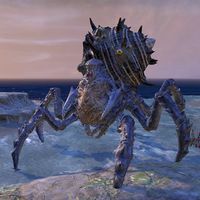 Large, hostile, spider or crab-like sea creatures found on Summerset. 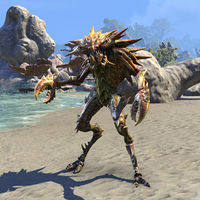 A hostile sea creature found on Summerset and Artaeum. As the name suggests, they attack with projectiles from their mouths. A hostile sea creature found on Summerset and Artaeum. A type of eel that can be found in Stormhaven. A tan colored type of fish that can be found in Craglorn. The Yokudan Warhorse, according to the book A Child's Tamriel Bestiary, was ridden into battle by the Forebears. This page was last modified on 1 September 2018, at 17:34.